Toll If You Please finds Paul Peel embracing a longstanding narrative tradition in art—one that produced vignettes of social interactions. 18th-century British engraver William Hogarth was a master of this tradition, creating “story cycles” like The Rake’s Progress (1735) to comment satirically upon contemporary mores and behaviour. 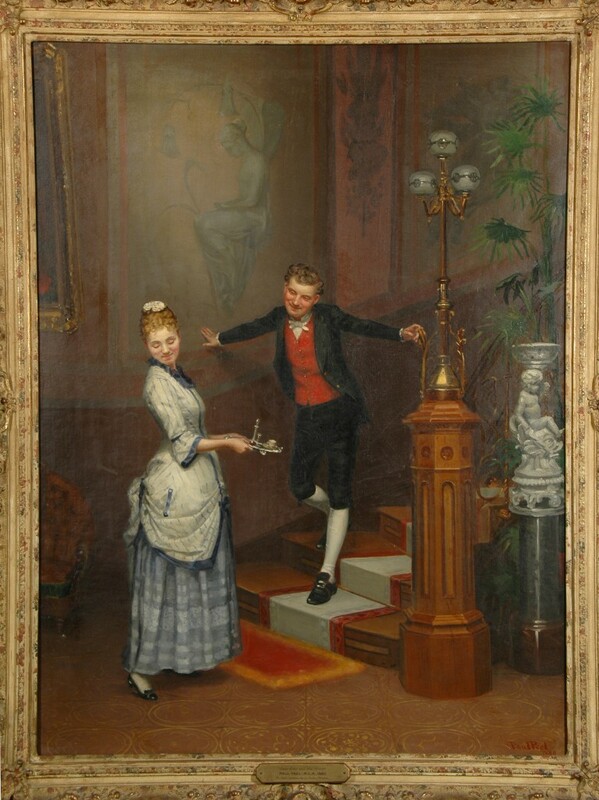 In Toll If You Please, Peel depicts a flirtatious interaction between a maidservant and a young man who seems to be of a higher social status. If there are darker implications to this encounter, Peel does not emphasize them. Unlike Hogarth, he seems more interested in capturing a moment of youthful bravura and bashfulness than in setting the stage for moral ruin. 1880 was a busy year for Paul Peel. He completed studies at the Pennsylvania Academy of Fine Art, won three prizes at London, Ontario’s Western Fair, and was elected to the Ontario Society of Artists. He also studied briefly at the Royal Academy of Arts in London before embarking on the greatest adventure of his life, studying art in Paris.